Donald Trump's newly appointed campaign chairman, Steve Bannon, faced multiple charges, including one for misdemeanor domestic violence, stemming from an incident involving his ex-wife more than 20 years ago. But Trump campaign manager Kellyanne Conway tells CNN it will not affect his future with the campaign. The case, which was first reported by Politico Thursday night, was eventually dismissed, and a spokesperson for Bannon has said that he has "a great relationship" with both his ex-wife and their twin daughters. 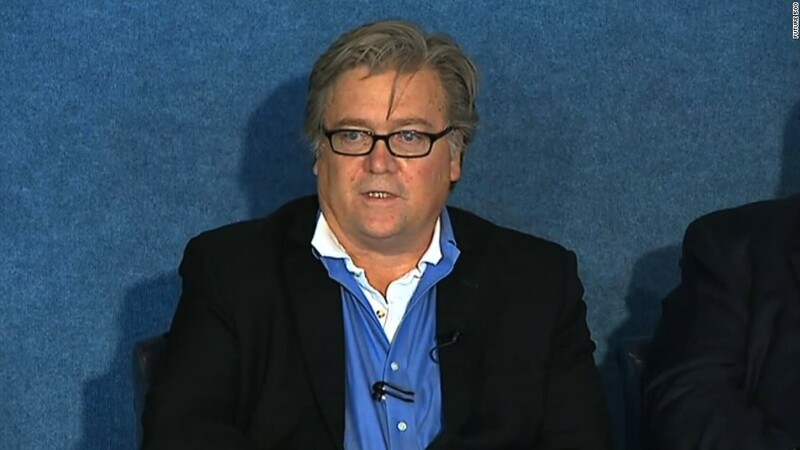 A Santa Monica, California police report from January 1, 1996 detailed an altercation between Bannon and his then-spouse that left her with red marks on her left wrist and the right side of her neck. The report also said that the woman, whose name Politico redacted in its article, "complained of soreness to her neck." "On my arrival, I was met at the front door by [REDACTED]. She appeared as if she was very upset and had been crying," the responding officer wrote in the report. "I saw that her eyes were red and watery. She first said, 'Oh, thank you. You are here. How did you know to come?'" The officer informed her that he was responding to a report of a 911 hangup. Bannon and his ex-wife married in April of 1995, according to the report. Their twin daughters were less than a year old at the time of the incident. The charges Bannon faced afterwards, including misdemeanor domestic violence, battery, and dissuading a witness, were dropped in August of 1996, and the couple divorced shortly thereafter. "The bottom line is he has a great relationship with the twins, he has a great relationship with the ex-wife, he still supports them," Bannon's spokeswoman Alexandra Preate told Politico. Preate did not respond to a request for comment from CNN; Trump campaign spokespeople also did not respond to multiple requests for comment. However, asked by CNN whether the domestic abuse charges would affect Bannon's future with the campaign, Conway gave a one word answer: "no." CNN also confirmed with Santa Monica Police that the police report was authentic. The Politico report came on the heels of a critical speech by Hillary Clinton on Thursday in which she pilloried Trump and Bannon, who previously ran Breitbart News. Speaking in Reno, Nevada, Clinton said that Trump has embraced the "alt-right," a fringe ideology animated by white nationalism. "The de facto merger between Breitbart and the Trump Campaign represents a landmark achievement for the 'Alt-Right,' a fringe element has effectively taken over the Republican Party," Clinton said. "This is part of a broader story -- the rising tide of hardline, right-wing nationalism around the world." -- CNN's Chris Frates, Jack Hannah and Scott Glover contributed reporting.